This article appeared in the Spring 2007 issue of Texoxa Living!. How does a new rose variety gets its name? Does Barbara Bush smell better than Barbra Streisand? If you are an aficionado of new rose varieties, then you know that Streisand has the edge on scent. It was the star herself who supervised the details as a rose was born. She tested a number of candidates and settled on a highly fragrant lavender hybrid tea as her namesake. With today’s roses, it’s as much about marketing as gardening, and growers are formulating ever more complex crosses. Once named for the qualities of the breed, today it is just as important to have a name that sells. Jackson & Perkins is the largest U.S. breeder of patented roses, selling over 3 million each year. Founded in 1872 by Charles Perkins, with money lent to him by his father-in-law, the nursery began selling strawberries and grape plants. Twenty-four years after opening the doors, Perkins hired E. Alvin Miller. Miller in his spare time liked to experiment with hybridizing roses and five years later created a climber variety. He called it the Dorothy Perkins—for Charles’ granddaughter—and it became one of the most widely planted roses in the world. Tens of thousands of rose bushes are growing in hundreds of fields, each labeled with a number or code name. It takes about ten years, on average, to develop a new breed for market. The great chef of French cuisine, Julia Child, chose as her namesake a flower that blooms as butter yellow, then fades to a rich cream color and smells of anise. Child’s rose is marketed by a California grower in the fertile San Joaquin Valley. If you’re wondering who keeps track of all these varieties and their names—that would be the Shereveport, LA.-based American Rose Society. The rules are simple. The breeder gets to name his creation. 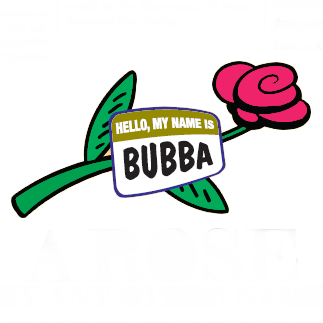 But if you want to give your new rose a person’s name—say, the Bubba Jones after your cousin—you’ll need his written permission. Oh, and you can’t use the name of another plant genus, so no Dahlia rose. According to Committee member Marily Young, you cannot use a profane word or anything otherwise defamatory or inflamatory. Before the 1950s, roses named for people mostly honored royalty, relatives of the grower, and a few deceased notables. During the 1950s the idea arose of marketing roses named after more contemporary famous people—including film and music stars. Crooner Bing Crosby was so honored (no it was not black and blue) as were Bob Hope, Audrey Hepburn, Marilyn Monroe, Elizabeth Taylor, Carmen Miranda, Eva Gabor, Ingrid Bergman—the list goes on and on. As for myself, I would probably prefer a Monroe rose over a Hope. Here in America we don’t have actual royalty, so we have to settle for politicians. It would be possible to plant a garden with nothing but Republican roses, including the Mr. Lincoln, Ronald Reagan, Eisenhower, and the Herbert Hoover, which goes nicely with formal gowns. Only three democratic presidents have roses named for them—Woodrow Wilson, Franklin Roosevelt and John F. Kennedy. First ladies have done well for themselves when it comes to rose naming rights. Pat Nixon (who is responsible for establishing the famous White House Rose Garden) has one, as do Barbara Bush and Laura Bush. Jackson & Perkins sent a bunch of roses to the latter Bush. She chose a brown rose, with yellow on the underside of the petals. Dems probably think there’s a conservative plot behind the paucity of blooms from their side of the aisle. But wait. There is a Hillary Clinton rose, (the Hillary First Lady) but it was bred in France. That’s not good. Meanwhile, named roses come and go. Some become perennials in the marketplace, but there will always be a bouquet of new varieties to buy. The language of roses is thought to have originated in Persia in the 15th century and was brought to Europe in the 18th. By the 19th century a “floral code” developed and a complex language arose to allow people to send messages via bouquets. According to the website everyrose.com, these are some of the most common colors and their associations.